It's ok Jeep, just give Europe the good stuff first. Though Jeep is an American brand, the compact Renegade was clearly built to appease buyers across the pond in Europe. 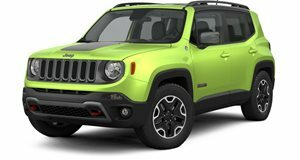 Perhaps this is why Europe has just received an updated 2019 Renegade, while the US will still make due with the 2018 model. US buyers shouldn't be too upset with Jeep, because this new 2019 Renegade is simply a facelift, not the all- to be in development. This new 2019 model adopts a new, more aggressive front and rear fascia, as well as some minor changes to the interior. The first major difference between the European 2019 Renegade and the US-spec car is what's under the hood. Europeans can choose from a variety of engine options including a 1.0-liter with 120 horsepower, 1.3-liter with 150 hp or 180 hp, or two diesel engines including a 1.6-liter with 120 hp, and a 2.0-liter with 140 hp or 170 hp states of tune. In the US market, Jeep only offers a 1.4-liter engine with 160 hp and a 2.4-liter engine with 180 hp. Power for the European model will be sent to the front or all four wheels via a six-speed manual gearbox, a seven-speed dual-clutch, or a nine-speed automatic. Four trims will be offered, with the Trail-Rated Trailhawk sitting at the top of the range. The 2019 Renegade will go on sale in Europe in September, 2018. As with the outgoing model, the Renegade will continue to be built in Italy, at FCA’s Melfi SATA Plant. Jeep hasn't said whether these new changes would make their way to the US-spec Renegade, although we find it hard to imagine that the American market car won't be updated at a later point.